Now, if we define «ولی» as guardian and authority, it is not in contrast with other verses of Quran, because the supervision is not for everyone. And it does not seem that everyone can be able to command us and be our guardian, except for those who are assigned to such position by Allah. And this verse says that after Allah and His Messenger, Wilayat which means guardianship is for person or people who give Zakah during bowing. Now we should discover that who are the person or people who give Zakah as they bow during the prayer who are responsible for the important task of Guardianship after Allah and His Messenger. The best evidence for this matter is to refer to the reason of the revelation of this verse. A poor came to Masjid Al-Nabi and asked Muslims for help, nobody helped him but Imam Ali (PBUH) who gave his ring to the poor man while he was bowing in the prayer and this verse (Al-Ma’ideh, 55) was revealed to the Prophet Muhammad (PBUH). In this verse Allah has expressed a special sign for the believers who have the position of Wilayat and introduced them as people who give Zakah as they bow during the prayer. For better comprehension of this verse, it is necessary to explain how can a person be introduced to others through providing descriptions, so that people refer to him. Generally, a person can be described in two ways. One is that the speaker gives a special sign and his or her intended person is one specific person and the sign does not include someone else. The second type is that the speaker gives a general sign and everyone who has that sign is the intended person of the speaker. To clarify this issue, we will mention an example for each kinds of description. Someone asked a question from a professor: which one of your students is wiser than others? The professor answered: the student who is clearer than others. Since being clean and being wise do not fit to each other, so the professor wanted to specify a sign by his short answer and to say only this person (and with this attribute), is my intended person. In fact, the professor specified a specific criterion for a specific person and if someone becomes clean after professor’s answer, could not be included in his answer. Because professor’s answer has been said in a specific time and referred to the wisest person and in other times it has no meaning. In this case and in similar cases, by professor’s answering it may also comes to our mind that being clean is one of the pleasant features to him and he loved cleanliness. Also he indirectly told his students to be clean, if you cannot be the wisest. Now, if the professor answered: the student who studies more than others is the wisest; it would not be a specific criterion any more. Because studying and being wise fit to each other and the person who studies more can be the wisest person. So, here, the professor introduced a general sign and made studying equal to being wise and it is not subject to any specific person. To use this, we will analyze the verse in question. In this verse, Allah has said after Him and His Messenger, those who give Zakah during bowing, are guardians of the believers. We can see that there is no relationship between giving Zakah during bowing and being guardian of the believers. So, the description that is used in this verse to introduce the believers (those who are guardian of other Muslims) belongs to the first type of description. And Allah has given a sign in a specific time to determine the person who is people’s guardian after Him and His Messenger. According to the reason of revelation of this verse, it is obvious that Allah’s intended person was nobody except Ali ibn Abi Talib (PBUH). And also it is clear from this verse that one of the pleasant factors to Allah is giving Zakah during bowing. It means that Allah says to the believers, indirectly: even if you cannot be the guardian of the believers, try to give Zakah to the poor and do not delay this pleasant deed because of praying, since it is pleasant to Allah. Here it is necessary to pay attention to another important point; in this verse the word مؤمنین (the believers) is in plural form, however you may ask why this word is plural while it was said that مؤمنین refers to Imam Ali (PBUH). In this regard, it is important to bear in mind that it is not permissible in Arabic language to use singular word to refer more than one person, but the visa versa is permissible and correct. In the following, we will just mention the verses‘ address and the commentators’ opinion for the sake of brevity. According to what was said we can conclude that it is permissible to use a plural word for a single one and there are several cases like this. Paying more attention, we can understand another issue from the verse: although Allah has assigned Wilayat of the believers to Prophet (PBUH) and Imam Ali (AS), but used «ولیّکم» that is singular, instead of «اولیائکم» which is plural. By using «ولیّ» (guardian) in singular form we can understand that Allah the Almighty wanted to offer His right of Wilayat to Prophet Muhammad (PBUH) and Imam Ali (AS), without disclaiming this position of Himself. So, their Wilayat is of the same type of Allah’s. It means that if Allah had said «اولیائکم» (guardians), it was obvious that He had spoken about several types of Wilayat that some people have. While Allah did not say in this way and he had specified one type of Wilayat. In fact, Allah’s Wilayat is of the same Wilayat of Prophet and Imam Ali (PBUT), the difference is that Allah’s Wilayat is inherently and independently. This means that nobody has provided His right of Wilayat. (Because Allah is the Creator of all things and should be the guardian and authority of all things.) But Allah has granted the right of Wilayat to Prophet Muhammad and Imam Ali (PBUT) and it is dependent on Allah’s Wilayat. As Shiites believe, Prophet Muhammad and Fourteen Infallibles (PBUT) are servants of Allah and whatever they have is from Allah, and He has granted to them and they have nothing of their own. 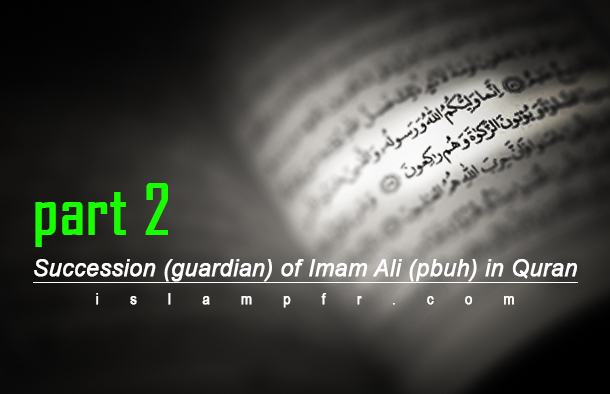 Holy Quran has explained about Willayat and guardianship of the believers in different verses, in detail. The meaning of Wilayat in the verse that we spoke about is being guardian and authority. Quran has proved Wilayat only for specific individuals and does not accept it for others. According to Quran, the position of Wilayat to the believers originally is Allah’s own and other individuals’ Wilayat can be accepted only when Allah assigns it to them. The believers should refer to their Guardian in all things and follow him and make him a model for themselves.